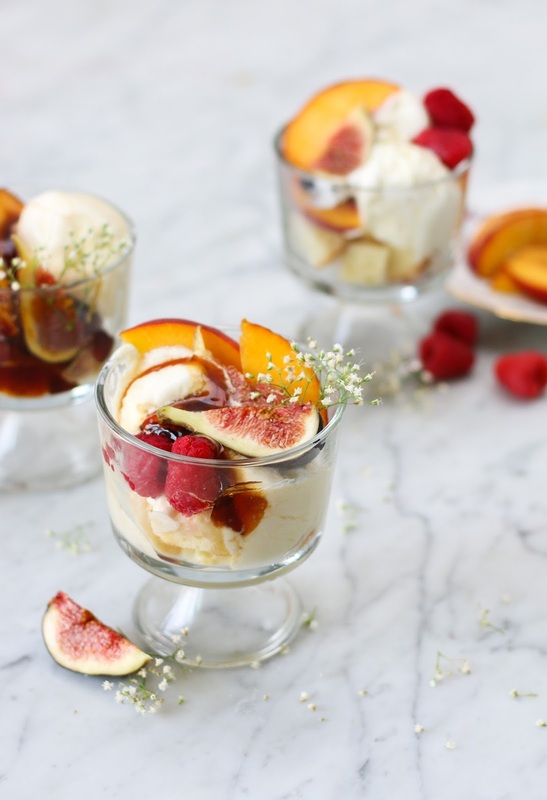 Traditionally, Peach Melba is a dessert of peaches, vanilla ice cream, and raspberry sauce. 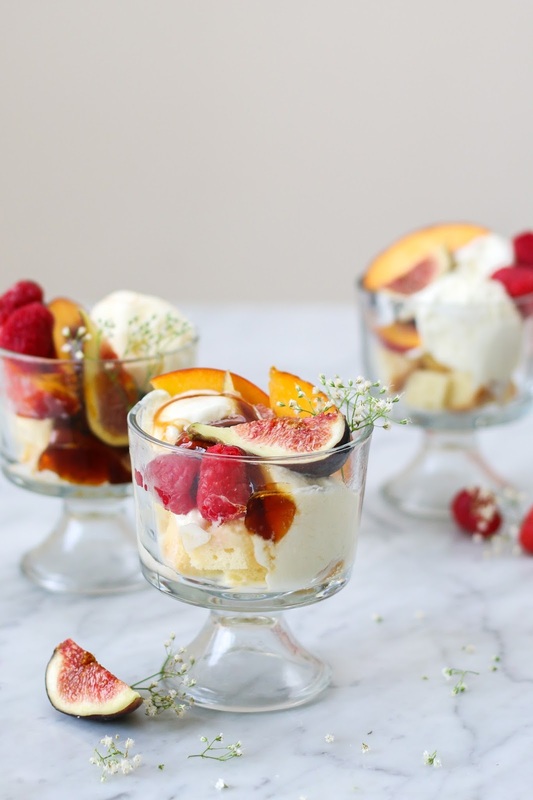 This dessert was invented by Auguste Escoffier and for the first rendition of this dessert, all three components of it were served in an ice sculpture of a swan. 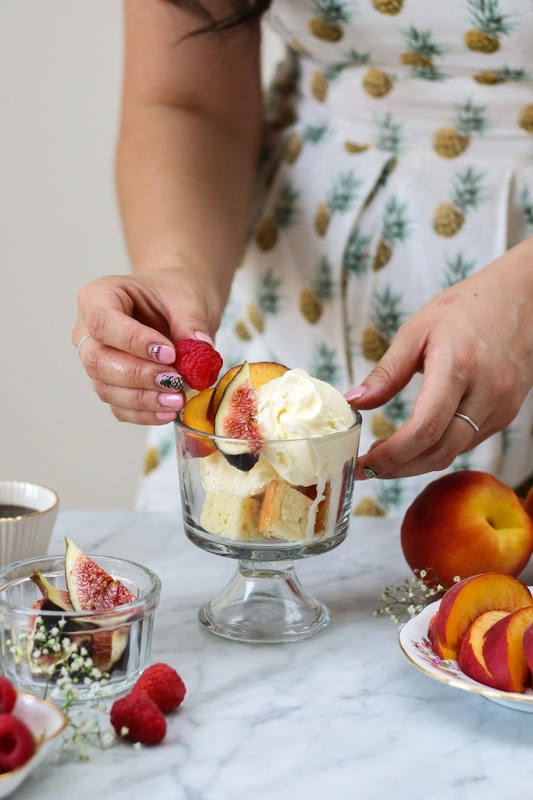 You will not find an ice sculpture of a swan here on the blog today unfortunately, but you will find a Peach Melba-inspired sundae. I say 'inspired' because apparently Escoffier said that "any variation on this recipe ruins the delicate balance of its taste" and I do not want to be angering any well-respected French chef. That is not the purpose of my blog post today. I have been going to quite a few farmers market this summer. Prior to this year I have not really been to an outdoor market even though Vancouver is littered with them throughout the summer months. It was a mixture of two things that started my love for these markets - how they remind me of the les marchés that my Mom and I explored daily when we spent ten days in Paris and how the market provides endless sources of inspiration for seasonal baking. It is a also quite a nice date idea, sharing freshly baked pastries and coffee while you stroll around the market on a warm summer morning. Quite a few stone fruits are in season right now (did you know that raspberries are stone fruits?!). 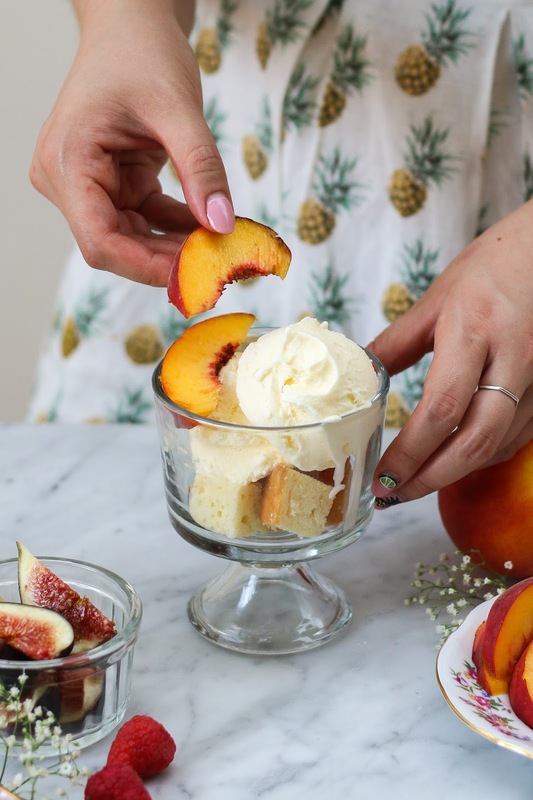 A perfectly ripe peach is my weakness and when I saw all the perfectly lined up green containers of local peaches at the market, I knew peaches would be the star of the next blog post. 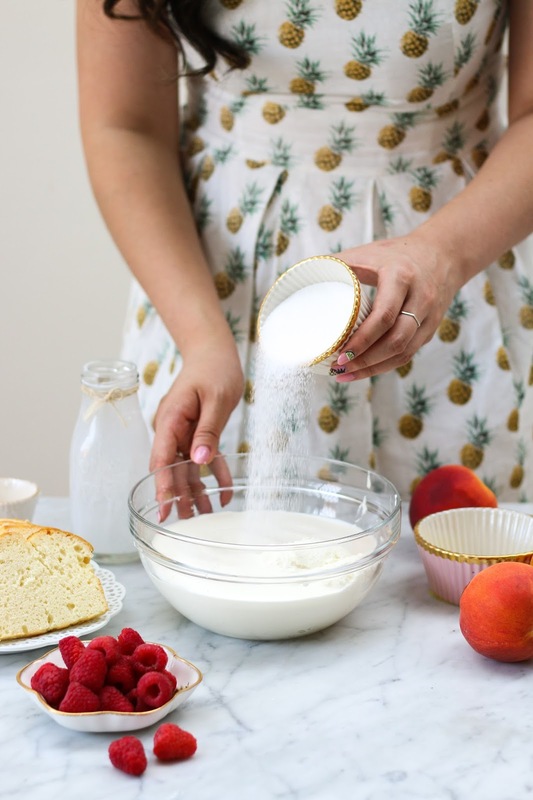 I wanted to stray away from peach pie because I did not want to be dealing with keeping pie dough chilled in this summer weather. After some extensive 'research' (aka. 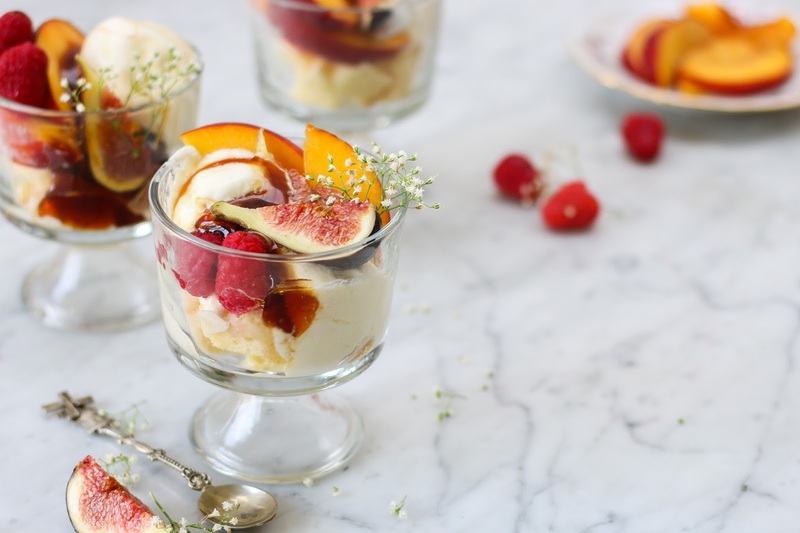 ask my friend Tessa for peach dessert ideas) I decided on Peach Melba, but with a few twists. I kept the peaches as they were because I cannot be messing around with the peach of Peach Melba, but had some fun with the other components of the classic. The base of the sundae is composed of a layer of cubed buttery pound cake. 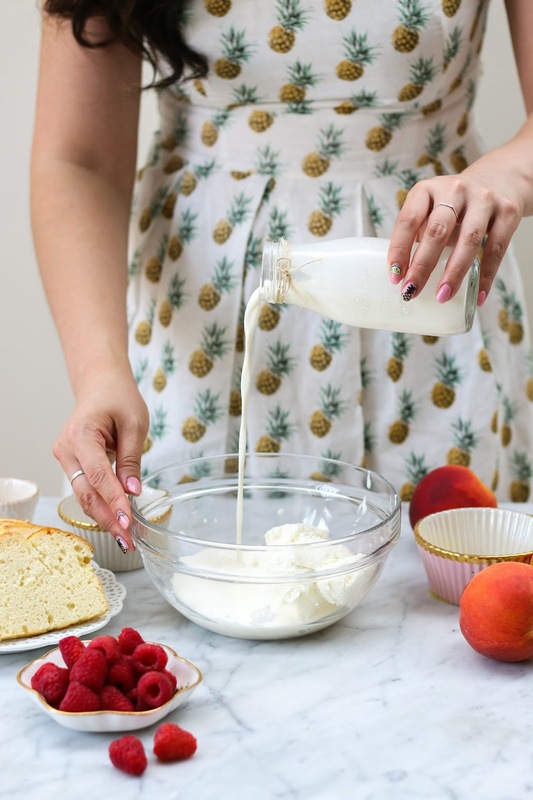 A traditional Peach Melba does not have any form of cake but when I get to add cake to a dessert, I will always happily do so. It is then topped with two scoops (maybe three if you wanted the extra fun, but never just a sad single scoop please) of homemade velvety cream cheese ice cream. 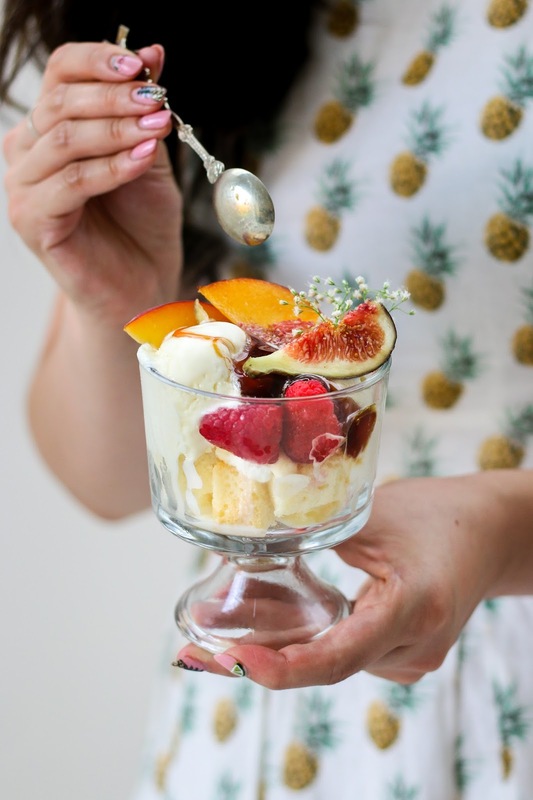 Fresh peaches and raspberries from the market garnish the sundae. 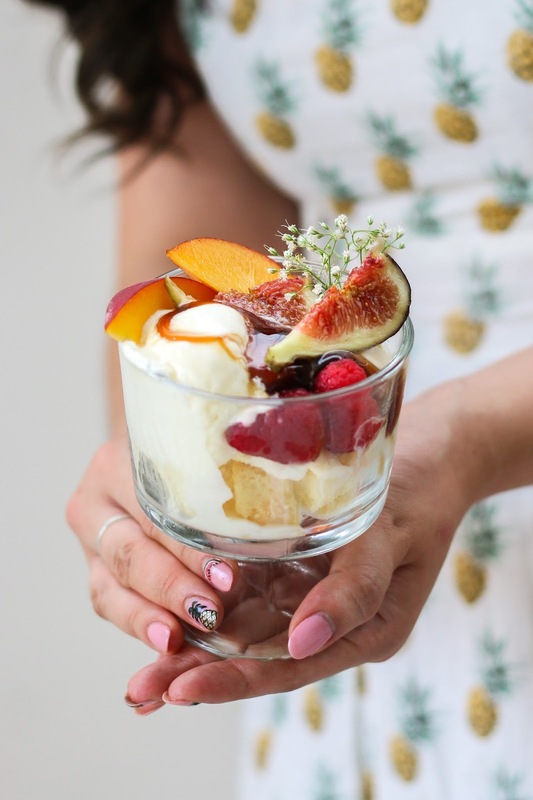 You might find an occasional fig slice in mine because I love a ripe fig in the summer as well. 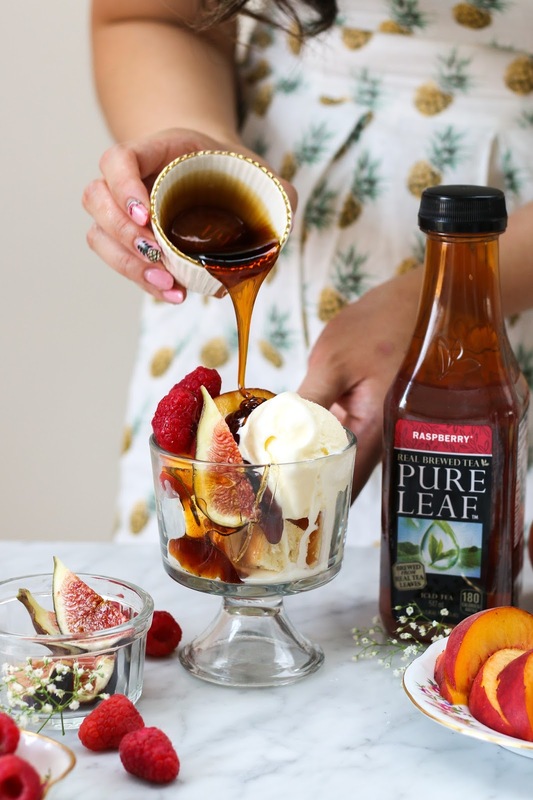 To play on the raspberry sauce component, the sundae is finished off with a raspberry iced tea syrup. This raspberry tea syrup is so good. It will remind you of a chilled glass of iced tea in the summer, but better. It is much like a concentrated iced tea, with all the pleasantly bitter components of iced tea but it also has a sweetness that ties the sundae together. Preheat the oven to 325F and grease a 8 x 4-inch loaf pan. In a bowl of a standing mixer, cream the butter, sugar and vanilla until smooth. Add the eggs and continue beating. Gradually add the flour and mix until just incorporated. Pour the batter into the pan and level it. Bake for 50 - 55 minutes or until a toothpick inserted in the centre of the cake comes out clean. Cool before slicing. 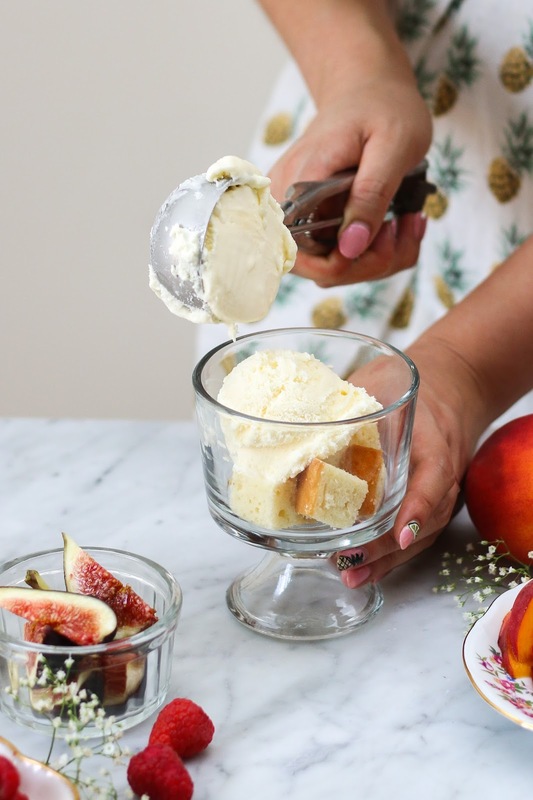 To make the ice cream, combine the cream cheese, milk, cream, sugar, salt, and vanilla, in the bowl of a large food processor fitted with a blade attachment. Blend on high speed until smooth. Transfer the mixture to the bowl of an ice cream maker and churn according to the manufacturer's instructions. When ice cream in done churning, spoon it into a freezer safe container. Allow ice cream to rest in the freezer for at least 3 hours until firm. In a small sauce pan over medium heat, combine Pure Lead Raspberry Iced Tea and sugar. Keep reducing the iced tea until roughly 1/3 cup of liquid remains. Transfer to heat-safe container to let cool. Note: syrup will become much thicker when cooled. Top each sundae with two generous large scoops of cream cheese ice cream. 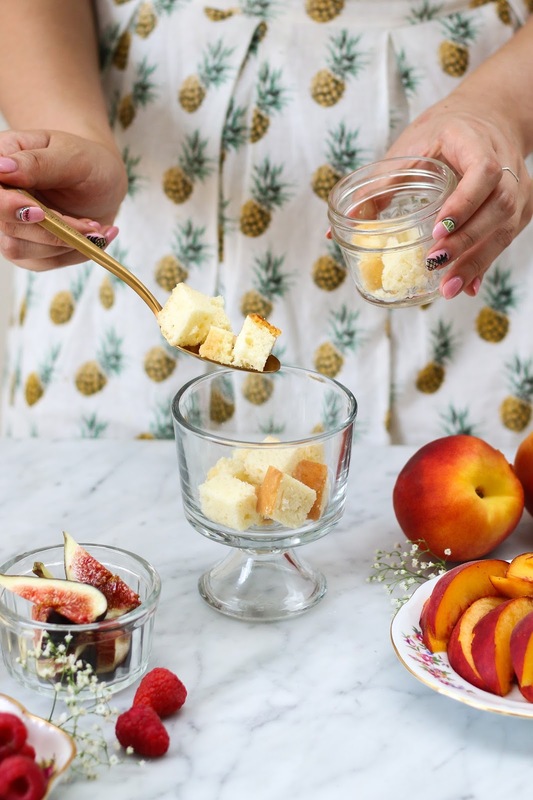 Garnish with peach slices, raspberries, or any other fruits that are in season. Drizzle with raspberry iced tea syrup and serve immediately. Thank you PURE LEAF for supporting Constellation Inspiration! 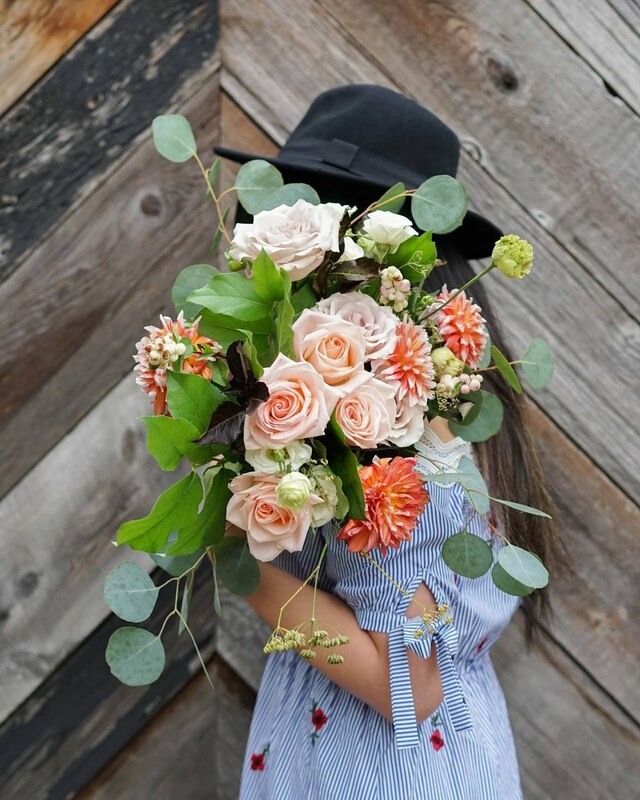 Welcome to Constellation Inspiration, a buttercream-coated journal of recipes, stories, and love letters that are sweet to read, and even sweeter to eat. These love letters are dedicated to you. Sign up for all the latest news and recipes!